Survival in the wilderness - Gary Paulsen writes about it so powerfully in his novels Hatchet, The River, Brian's Winter, Brian's Return, and Brian's Hunt because he’s lived it. These essays recount his adventures alone and with friends, taking listeners through the seasons. In Paulsen’s north country, every expedition is a major one, and often hilarious. Once again Gary Paulsen demonstrates why he is one of America’s most beloved writers, for he shows us fishing and hunting as pleasure, as art, as companionship, and as source of life’s deepest lessons. 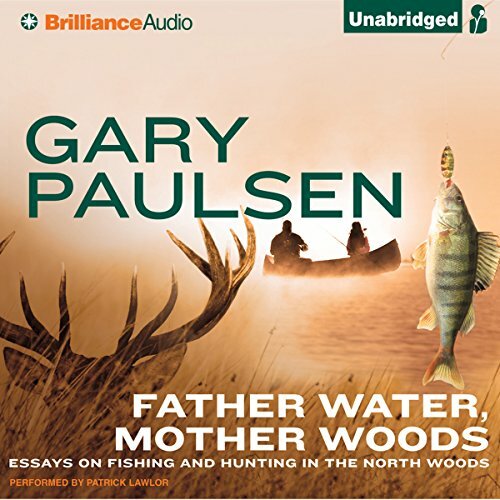 ©1994 Gary Paulsen (P)2012 Brilliance Audio, Inc. I was not sure what this book was about but I liked the title and the price was right, I was very surprised as I listen to the story, it was wonderful, it was captivating, and enjoyable. I couldn't help but laugh throughout the story. The narrator was excellent and I would recommend this book to anyone. Fishing and hunting with the seasons. Would you listen to Father Water, Mother Woods again? Why? I have listened to it twice so far. It's a fantastic story about Gary in his adolescence. Fishing and hunting with the bare essentials. People using steel rods, old second hand reels, making your own lures. Wearing army surplus clothing for hunting and a single shot .22 as your only firearm. He also captures what every angler thinks and puts it on paper. "The next cast will be the one." The books gives you incite in a time forgotten when kids didn't have tv or video games. Fishing and hunting is what they did. What other book might you compare Father Water, Mother Woods to and why? I haven't read/listened to anything like it so far. What does Patrick Lawlor bring to the story that you wouldn’t experience if you just read the book? He does a great job narrating the story especially the boys arguments or teasing they do to each other. I enjoyed the part about fishing for suckers with bows and spears. Hiding on the back porch reading books, eating smoked fish and washing it down with cold pepsi. I have yet to read/listen to any of Gary's books I didn't enjoy. The only thing that could make this book better is if Gary read it himself.